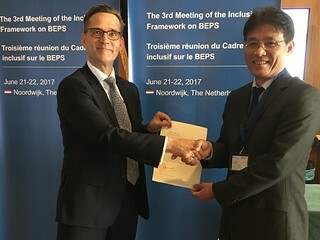 21/06/2017 – Viet Nam has become the 100th jurisdiction to join the Inclusive Framework on BEPS ("IF") on an equal footing with all other IF members, as announced by Mr. DANG NGOC Minh (Deputy General Director of the General Department of Taxation - GDT) at the third plenary meeting of the IF held on 21-22 June 2017 in Noordwijk, the Netherlands. The announcement represents another important step forward by Viet Nam in the international tax arena as well as in the Asia-Pacific region where Viet Nam's active leadership in its role of host and Chair of the APEC Finance Ministers' Process in 2017 has been widely recognised in the support of the BEPS Project and its consistent implementation throughout APEC Economies. The IF was established in January 2016, after the G20 Leaders urged the timely implementation of the BEPS package released in October 2015 and called on the OECD to develop a more inclusive framework with the involvement of interested non-G20 countries and jurisdictions, including developing economies. Members of the IF have the opportunity to work together on an equal footing with other OECD and G20 countries on implementing the BEPS package consistently and on developing further standards to address remaining BEPS issues. Being part of the IF will facilitate the implementation of agreed minimum standards, as well as the peer review processes and will provide Vietnam with further support, including guidance under the Platform for Collaboration on Tax established among the IMF, the OECD, the UN and the WBG. Viet Nam has also stated its commitment towards greater tax transparency by expressing its interest to join the Multilateral Convention on Mutual Administrative Assistance in Tax Matters ("the Convention") and the Global Forum on Transparency and Exchange of Information for Tax Purposes (the Global Forum). The Convention is the most comprehensive multilateral instrument available for a wide range of tax co-operation to tackle tax evasion and avoidance, and guarantees extensive safeguards for the protection of taxpayers' rights. The Convention was developed jointly by the OECD and the Council of Europe in 1988 and amended in 2010 to respond to the call by the G20 to align it to the international standard on exchange of information and to open it to all countries, thus ensuring that developing countries could benefit from the new more transparent environment. It is seen as the ideal instrument for swift implementation of the new Standard for Automatic Exchange of Financial Account Information in Tax Matters developed by the OECD and G20 countries as well as automatic exchange of country by country reports under the BEPS Project. Already 111 countries and jurisdictions have joined the Convention. The Global Forum is the premier international body for ensuring the implementation of the internationally agreed standards of transparency and exchange of information in the tax area. Through an in-depth peer review process, the restructured Global Forum monitors that its members fully implement the standard of transparency and exchange of information they have committed to implement. It also works to establish a level playing field, even among countries that have not joined the Global Forum. The Global Forum now has 142 members on equal footing.